A German music event, billed as a celebration of love, peace and tolerance, has been cancelled indefinitely after 19 people were trampled to death in a stampede over the weekend. 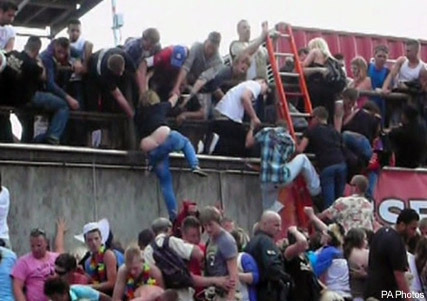 A further 342 people were injured at the festival, which had attracted over 1.4 million fans to an old railway station in the city of Duisburg, western Germany. The event, which has taken place annually since 1989, was an accident waiting to happen according to several witnesses. The decision to have just one tunnel operating as an entrance to the techno music party has been criticised, with many claiming that police had been warned about the overcrowding. The majority of victims were crushed at the tunnels entrance, as police reportedly closed the exit to the tunnel, telling newcomers to turn around. Panic then erupted. Police and officials have also been blasted for doing too little in the aftermath of the tragedy. Revellers revealed that victims were left crushed on the floor with stamp marks on their faces. The police and security personnel were more concerned with keeping people away from the edges, rather than helping them, party-goer Salil Bhate told the BBC. German police spokesman Detlef von Schmeling yesterday claimed, though, that officers had controlled the flow of visitors. He insisted there was no mass panic and that there was room to move. However, an investigation has now been launched into the deaths to discover what initially triggered the stampede, and who really is to blame for this catastrophe.